Omay Foods does ready-to-eat healthy snacks and trail mixes you can binge on without the guilt. You'll find everything from the classic khatta meetha to berry mixes that you can add to your salad. Doesn't matter if there are guests coming over around the festive season or friends coming over for a drink on the weekend–tasty trail mixes and little munchies go along in every situation. The unhealthy snacking options on the other hand, won't do any good. Omay Foods is changing that with their range of products that are 100% roasted and non-fried (and of course, taste amazing). 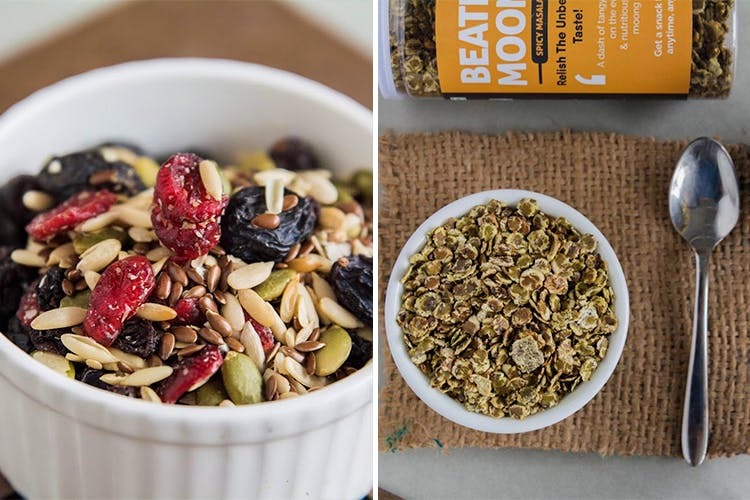 They've got trail mixes like seeds and fruits, oats and moong; beaten brown rice mixes in desi and soya bean versions; Khatta Meetha and Navratan mixes (yep, the classics) and treats like potato flakes, protein-rich solid soya bean, flax seeds and more. We say get their healthy trail and seed mixes to serve or gift during this upcoming festival season. You might even want to make 'em your go-to late night snack. There's not much we don't like around here. We just wish they add even more options to choose from. They've got a 4-in-1 gift box which you can customise with your favourite snacks. Better yet, use it as a healthy gift for that friend who wants to give up junk but doesn't know where to start. Also, the mixes work great as a pre-workout snack to give your body the energy for those extra reps.